flax seeds recipes | Indian Flax seed recipes. Flaxseeds are not new to Indian cuisine – they have been available since decades, known by the name of mukhwaas. Flaxseeds are tiny treasure troves of goodness, being high in fibre and omega-3 fatty acids . This is the perfect way to have your flax seeds daily. Take 1 cup flax seeds, 1 tbls lemon juice and 1/4 tsp salt and combine in a bowl. Cover and keep aside for 1 hour. Then dry roast in a pan for 3 minutes till you get flavour. Cool and store in a air tight container. Start with eating 2 tablespoons a day and have it 2 parts during the day. Follow recipe on how to eat flax seeds for details. Also what is important to know is how to roast flax seeds. The Garlic Flax Seed Chutney recipe. Made of garlic and flaxseeds, this chutney has a spicy taste that gives your taste buds an effective shake! Crushing garlic cloves activates an enzyme called Allinase, which helps convert Alliin to Allicin. This Allicin has appreciable health benefits, including anti-bacterial, anti-fungal and anti-viral properties. But we agree that peeling and crushing garlic can be quite a task! The South Indian chutney got healthier by adding flax seeds. This flax seed dry chutney recipe is made with flax seeds and kashmiri red chillies. You can mix the Flaxseeds Dry Chutney with til oil and serve as an accompaniment for idlis and dosas. A simple way is to mix flax seeds with curd and you have the recipe. Curds is also rich in good fats and proteins, calcium and vitamin D, and it helps in digestion too. So, this magical combination is a wonderful asset for weight-watchers and endurance athletes. For those who want their raita sweet, a good variation is flax seeds with curd and honey recipe. The Oats Flax Seeds Roti recipe features an absolutely healthy mix of ingredients, especially beneficial for those with high blood pressure because the beta glucagon in oats helps to keep both blood pressure and blood cholesterol under check. The famous Gujarati thepla has a new look with multi grain thepla recipe made with flaxseeds. We all love khakhras. This fabulous Rajgira Buckwheat Brown Rice Flour Khakhra, which is loaded with nutritious flours and flax seeds. Very few know that mukhwas is healthy if made correctly. This homemade multi seed mukhwas recipe is made with flax seeds, sesame seeds and fennel seeds. Guess what, we have used a little sugar and that is optional. Alsi (Flaxseeds) : Flaxseeds are high in soluble and insoluble fibre which prevents surges in blood sugar levels. Hence, this is beneficial to those who are diabetic. Flax seeds are the richest source of plant Omega-3 (n3) fatty acids. Since flaxseeds are not a very good source of sodium they are safe to be consumed by individuals with High Blood Pressure. Flax seeds contain high levels of Lignans which have benefits of anti-ageing and restoring cellar health and good for heart. 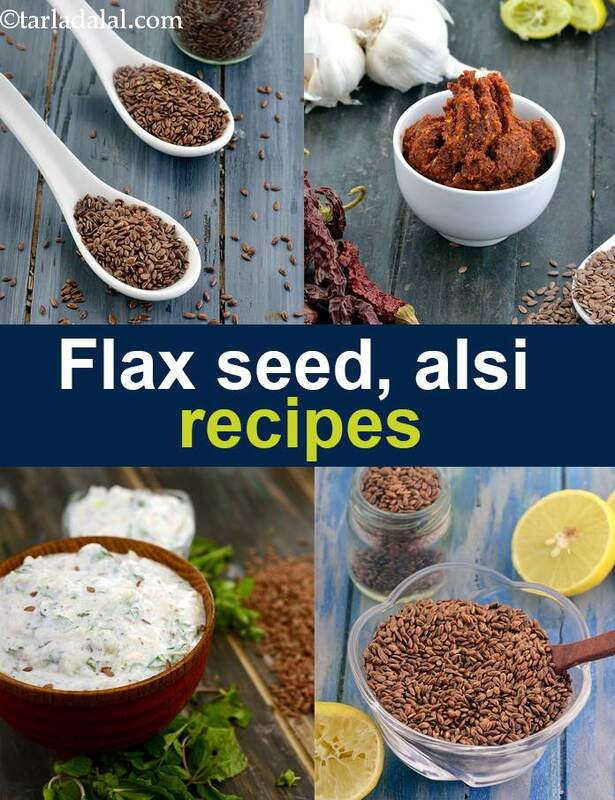 See detailed benefits of alsi, flaxseeds. Enjoy our flax seeds recipes | Indian Flax seed recipes given below.